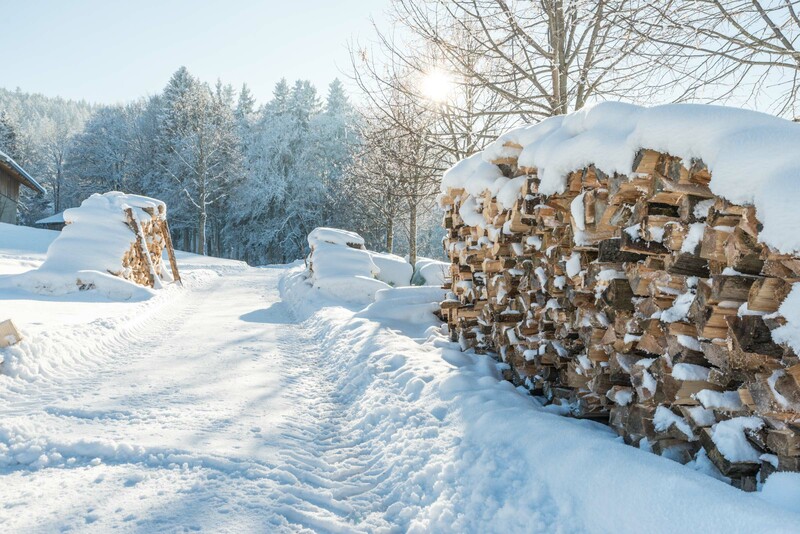 The moor village Bad Kohlgrub is home to Bavarias most elevated healing peat baths and has been the first place in Bavaria to be awarded with the WellVital label. 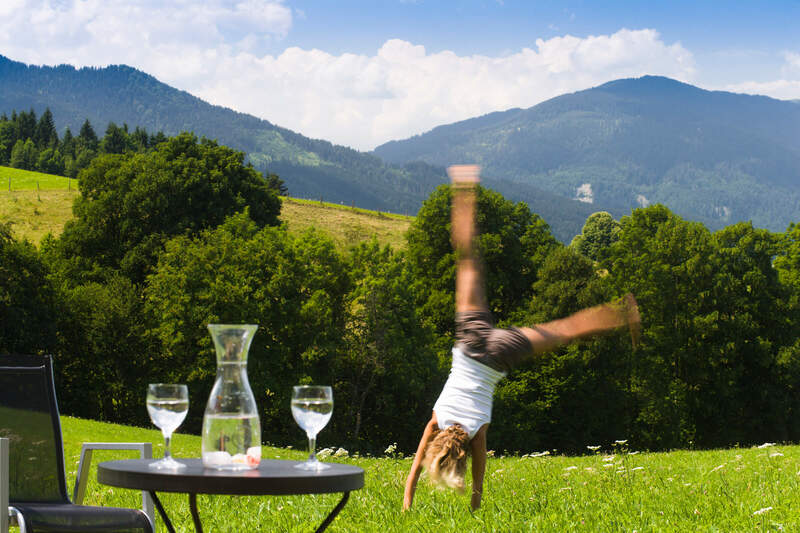 Our hotel is uniquely located in the idyllic “Sonnen” in Bad Kohlgrub and enchants visitors with a marvelous view as well as numerous possibilities for leisure activities. The people of Bad Kohlgrub are very hospitable and the atmosphere is lovely and rustic. Together with the magnificent mountains in this area, this makes our home a true Bavarian paradise. Mountain sport will let you experience wonderful days with your family. The large number of traditional festivities and other great events in the region makes sure that you never get bored in the afternoons and evenings. Bad Kohlgrub has been a health resort for more than 125 years. The natural Alpine mountain pine moor is to thank for the major part of Bad Kohlgrub’s success. The highly effective healing substances that can be found in the moor are a prehistoric natural treasure from the youngest ice age, which took place about 12,500 years. When the glaciers melted away, this treasure from the Alps early history was unearthed. Today, old and young alike benefit from it when they are visiting and relaxing here. Bad Kohlgrub was officially declared a health resort as early as 1870. The healing baths with substances from the raised mountain pine moor, however, are not the only “treasure” to be discovered in this place. Legend has it that the treasure of the “Venediger Manderl” (translates to “little man from Venice”) is still hidden somewhere on the Hörnle, Bad Kohlgrub’s local mountain. A Venetian merchant is said to have buried his riches here and many treasure hunters have tried to find it. So far to no avail. The summer is the season in which the mountains and pastures of the surrounding mountains show their full brilliance. Wild flowers, lush forests and green meadows adorn the mountain sides and mighty rocky summits tower over everything. 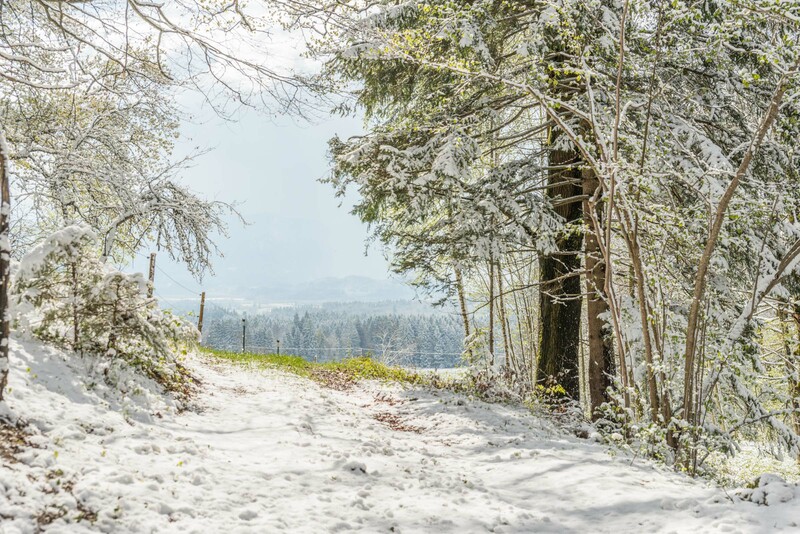 Especially in the early summer, when there is still some snow on the high plateaus, the mountains and valley of the Ammergau Alps offer a truly picturesque panorama that is hard to find anywhere else. Be active and climb the mountains or visit one of the lovely lakes of the area for a bathing trip. Or how about exploring the area on a nice bike tour. Taking the aerial lift in Bad Kohlgrub, you can easily reach the summit of the local mountain, the Hörnle. With about 6 kilometers of skiing piste, the local skiing area is small but family-friendly. It includes several other highlights, such as the 4.5-kilometer long toboggan track and 40 kilometers of well-kept cross-country skiing tracks. This skiing area at the Hörnle is therefore ideal for a bit of skiing before lunch or for a full day of ski-hiking or cross-country skiing. Ambitious skiers, freeriders or those looking for special challenges are best advised to visit the large skiing area Garmisch Classic in at Garmisch’s local mountain and the Alpspitze or the famous glacier skiing area the the Zugspitze. 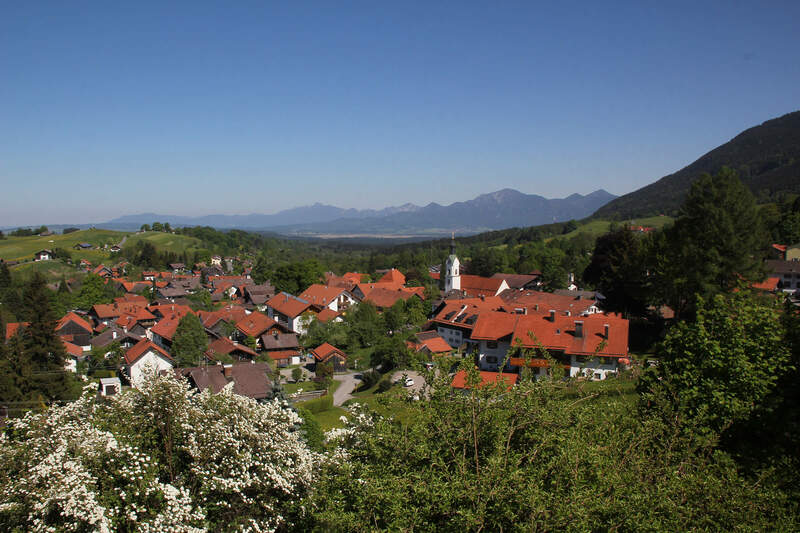 The villages and towns of southern Upper Bavaria not only offer an impressive landscape, but also numerous important historic sights and interesting places to go to. The area known as the Pfaffenwinkel (the “parsons’ area” – a reference to the large number of clerics in the region) is home to some of the most beautiful churches, monasteries and chapels in the world. The towns and villages of this region, such as Oberammergau, Murnau and Schongau, offer numerous events, such as theater plays, readings, and concerts. Last but not least, our guests will find some of the magnificent building projects of Ludwig II, such as the world-famous Neuschwanstein Castle and Linderhof Castle, in the immediate area of the hotel. 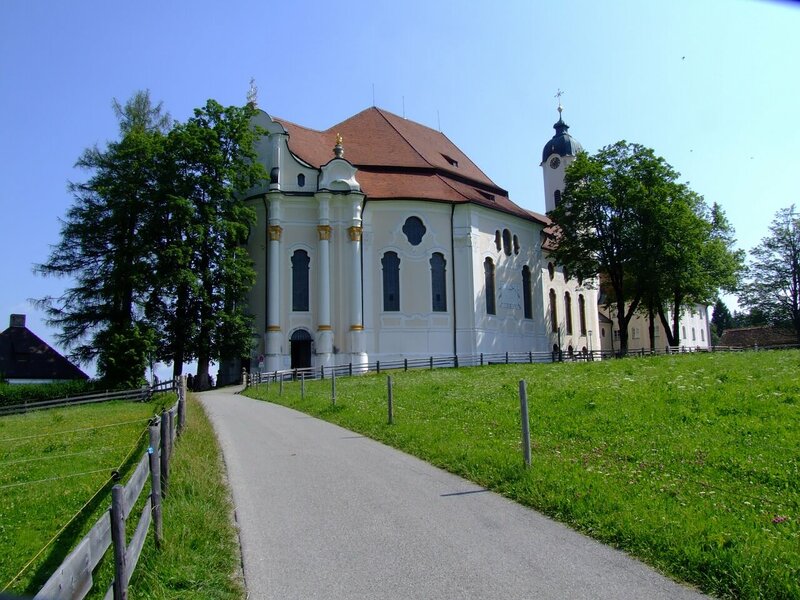 The Wieskirche (Pilgramage Church of Wies) is part of the UNESCO world cultural heritage. It is located in the famous Bavarian “Pfaffenwinkel” (an area famous for its many churches and monasteries), just 18 km from the hotel. Built by abbot Marian Mayr and master builder Dominikus Zimmermann, the Wieskirche features a marvelous interior design and is known to be one of the most beautiful churches in the world. Thousands of people visit the church each year. This includes both tourists and pilgrims. Experts consider the ivory-colored, bright room with its oval ground plan to be the perfect example of Bavarian Rococo. We recommend you visit one of the atmospheric evening concerts led by the churches organ player Anton Guggemos. 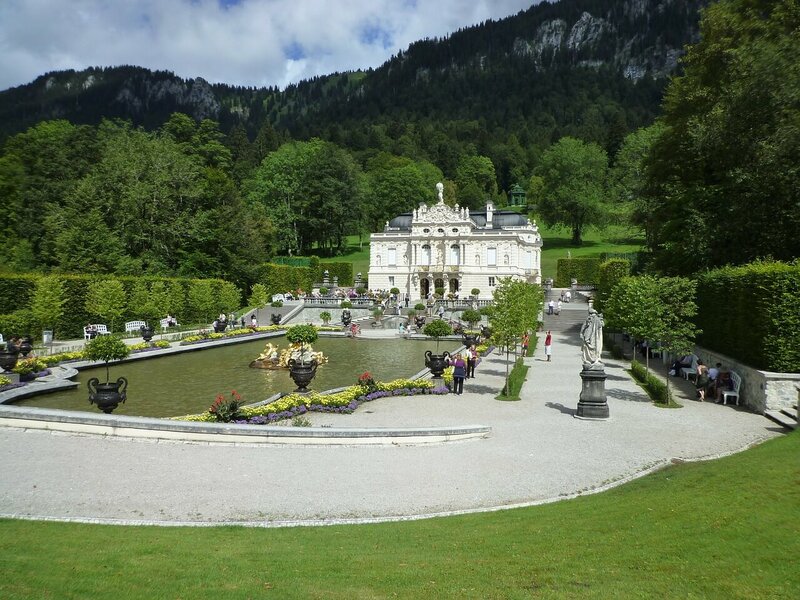 Linderhof Castle was one of the most important residences of Ludwig II of Bavaria. The style of the building is strongly inspired by the French Palace of Versaille and the feudal architecture of bygone times. This is where the depressed Bavarian king retreated to and dreamed of the past glory days of the European monarchy. The architecture of the castle’s park is based on a set from Wagner’s opera “Tannhäuser”. King Ludwig II had a shining grotto with an artificial lake built for this purpose. Ettal Abbey was built in 1330 by Emperor Louis IV, known as “the Bavarian”. It is one of the youngest monasteries of the Pfaffenwinkel. Today, the premises of the monastery comprise a boarding school, the monastery brewery, as well as several inns. 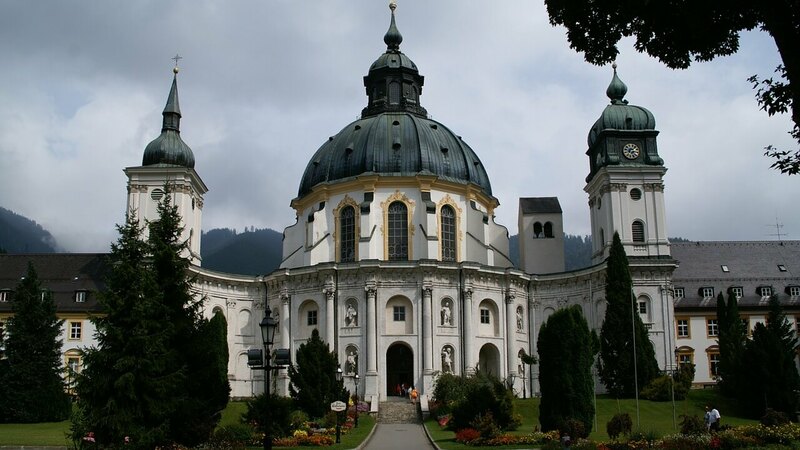 The beautiful church and the excellent food and drinks have made Ettal Abby a popular destination for day trips. Numerous people visit it every year. The monastery is located only 17km from the Hotel Sonnen and is always worth a visit. Oberammergau is world-famous for its passion play, which is based on a vow made in 1634. Those who had survived the plague vowed to perform a passion play regularly if they would be spared from the plague and their prayers were heard. 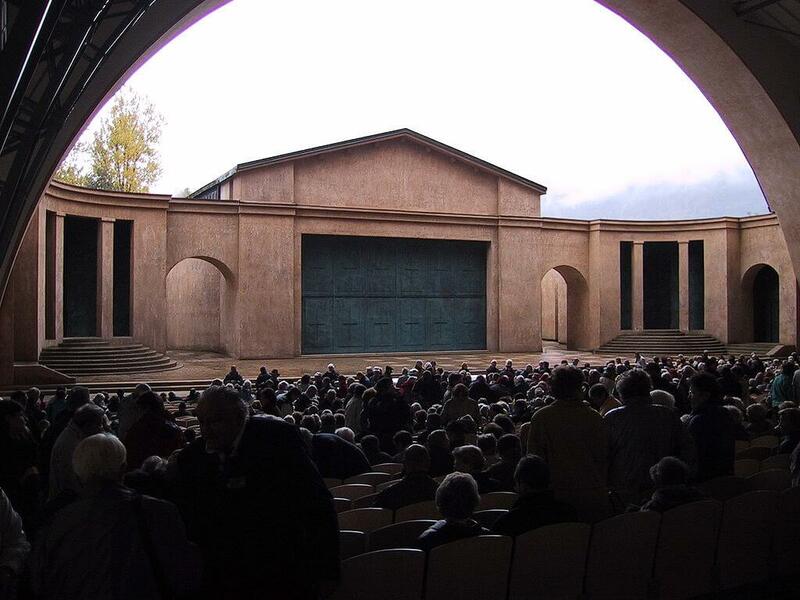 Since then, the Oberammergau Passion Play has been performed approximately every 10 years. But there is always something to see at the “Passionstheater”, even in the years between the actual passion play. In addition to numerous theater plays, it is possible to visit the theater as part of a guided tour. An entry ticket for the theater is also a ticket for Oberammergau’s museum.